Isabelle Melançon is a French-Canadian artist born in 1985. She grew up in a family of book and comic-lovers. She reads manga, European comics and American comics and has been drawing ever since she could lift a pencil. She used to want to be a dragon-riding knight, then envisioned a career change as a fantasy writer at the age of 10. Since then, Isabelle has been drawing her way through school, which included doodling on lockers, and graduated from the University of Ottawa with a visual arts and administration double-major. 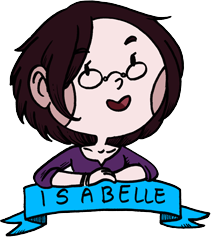 Isabelle has a few published graphic novels and art exhibits under her belt. Namesake is her first long-term project. Isabelle’s drawing style is heavily influenced by American and Japanese animation, as well as older Victorian and french illustration work, creating a fluid yet detailed mix. She is madly in love with fairy tales and literature and enjoys playing with the classics in her comic and written works. She has been maintaining a LiveJournal “comic journal” about her life and favorite fandoms for the past five years. She currently lives in Montréal, Québec with her significant other, “Link”. She bites and pokes with a rusty spoon when provoked and believes that sarcasm can be an art form.